NOTE: Sharding is a new feature with some limitations. Please read them before using it. OrientDB supports sharding of data at class level by using multiple clusters per class. 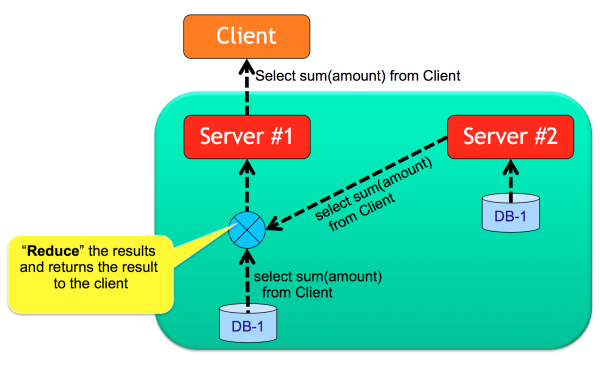 Under this model each cluster keeps a list of servers where data is replicated. From a logical point of view all the records stored in clusters that are part of the same class, are records of that class. This means that OrientDB will consider any record/document/graph element in any of the three clusters as “Clients” (Client class relies on such clusters). In Distributed-Architecture each cluster can be assigned to one or more server nodes. Shards, based on clusters, work against indexed and non-indexed class/clusters. You can assign each cluster to one or more servers. If more servers are enlisted then records will be copied across all of the servers. This is similar to what RAID does for Disks. The first server in the list will be the master server for that cluster. client_europe, will be managed only by the node, ”europe"
OrientDB automatically creates a new cluster per each class as soon a new insert operation is performed on a class where the local server has no ownership. When a node goes down, the clusters where the node was master are reassigned to other servers. As soon as that node returns up and running, OrientDB will reassign the ownership of a cluster to the server specified in the owner property if specified, otherwise to the server name indicated as suffix of the cluster (<class>_<node>). For example the cluster customer_usa will be assigned automatically to the server usa if exists in the cluster. This is defined as "Cluster Locality". The local node is always selected when a new record is created. This avoids conflicts and allows for the insert of records in parallel on multiple nodes. This also means that in distributed mode you can&apos;t select the cluster selection strategy, because "local" strategy is always injected to all the cluster automatically. If you want to permanently change the mastership of a cluster, rename the cluster by changing it’s suffix to that of the node you want assign as master. In the configuration above, if a new Client record is created on node USA, then the selected cluster will be client_usa, because it&apos;s the local cluster for class Client. Now, client_usa is managed by both USA and EUROPE nodes, so the "create record" operation is sent to both "usa" (locally) and "europe" nodes. Updating and Deleting of single records always involves all the nodes where the record is stored. No matter the node that receives the update operation. If we update record #13:22 that is stored on cluster 13, namely client_china in the example above, then the update is sent to nodes: "china", "usa", "europe". Instead, SQL UPDATE and DELETE commands cannot run distributed in case of sharding. For example, the SQL command delete from vertex Client works if the Client class is replicated across all the sevrers, but it won&apos;t work if the class is sharded by throwing a ODistributedOperationException exception with the following reason: "because it is not idempotent and a map-reduce has been requested". NOTE: if something happens during the iteration of the resultset, you could end up with only a few records deleted. If the local node has the requested record, then the record is read directly from local storage. If it&apos;s not present on the local server, a forward is executed to any of the nodes that have the requested record. This means a network call is made between nodes. In the case of queries, OrientDB checks for servers where the query targets are located and sends the query to all the involved servers. This operation is equivalent to a Map-Reduce. If the query target is 100% managed on local node, the query is simply executed on local node without paying the cost of network call. All queries work by aggregating the result sets from all the involved nodes. In this case the local node (USA) is used, because client_china is hosted on local node. In this case the query is executed across all the 3 nodes and then filtered again on the starting node. If the node that executes this command is not the master of cluster client_usa, an exception is thrown. OrientDB guarantees strong consistency if it&apos;s configured to have a writeQuorum to the majority of the nodes. For more information look at Split Brain network problem. In the case of Sharding you could have a situation where you&apos;d need a relative writeQuorum to a certain partition of your data. While writeQuorum setting can be configured at database and cluster level too, it&apos;s not suggested to set a value less than the majority, because in case of re-merge of the two split networks, you&apos;d have both network partitions with updated data and OrientDB doesn&apos;t support (yet) the merging of two non read-only networks. So the suggestion is to always provide a writeQuorum at least at the majority of nodes, even with sharded configuration. Sharded Indexes are not supported. If hotAlignment=false is set, when a node re-joins the cluster (after a failure or simply unreachability) the full copy of database from a node could have no all information about the shards. All the indexes are managed locally by a server. This means that if a class is spanned across three clusters on three different servers, each server will have it’s own local indexes. 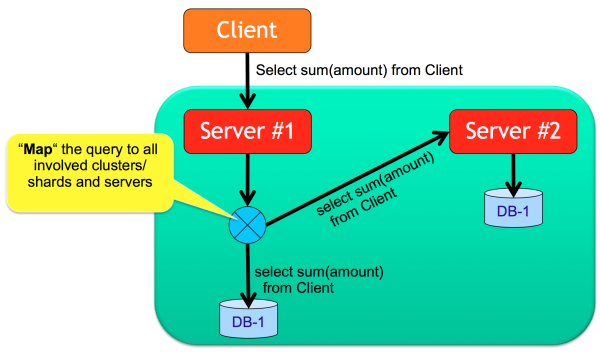 By executing a distributed query (Map/Reduce like) each server will use own indexes. With Community Edition the distributed configuration cannot be changed at run-time but you have to stop and restart all the nodes. Enterprise Edition allows to create and drop new shards without stopping the distributed cluster. By using Enterprise Edition and the Workbench, you can deploy the database to the new server and define the cluster to assign to it. In this example a new server "usa2" is created where only the cluster client_usa will be copied. After the deployment, cluster client_usa will be replicated against nodes "usa" and "usa2".